Brakes are critical in keeping your truck safe and on the road, so it’s important to ensure they are always working properly. When your safety and the efficiency of your truck are at stake, it’s time to make sure you’re getting expert brake maintenance to keep you on the road longer. When it comes to preventative break maintenance, there are three main areas you need to have a shop like National Spring keep in check for you. First you need to have the levels and condition of your brake fluids inspected. It is widely practiced to replace brake fluid every year, or every two years if your truck is an older model without anti-lock brakes (ABS). The next step in determining if your truck is having brake issues is having us take a look at the parking brake. If our expert mechanics conclude that your parking brake can’t hold the vehicle properly or if the cable condition is worn, you will be in need of some repairs. Finally, we will check over all of your brake components including the overall system, linings, rotors, calipers, and pedals. Any parts that are worn will need to be replaced sooner rather than later to maintain the integrity of the braking system. 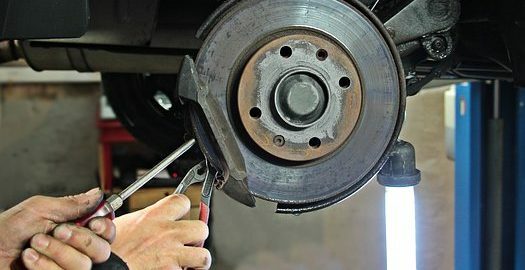 While getting your brakes looked at on a regular schedule is the ideal scenario, if you are experiencing any braking problems, that warrants more immediate attention. Two of the most common symptoms are problems with your truck’s balance and timing. Your truck’s wheels should be using the brakes equally, so they should ideally have the same amount of wear and tear over time. You know you’re having brake problems when your truck is pulling when you brake, since that probably means that one side of brakes is working overtime on your vehicle. And if you feel a pushing sensation when you brake, it is most likely that your trailer brakes are releasing after your tractor brakes, when it should be the other way around. When determining whether or not you need to head into the shop, you’ll be able to hear, see, feel, and sometimes even smell when something’s up with your brakes. If you’re ever driving along and you feel vibrations in your wheel or pedal, see your brake light come on, or notice that you have to press down really hard in order to make a simple stop, you know it’s time to get your brakes checked out. If you hear any loud screeching or squealing, that’s your truck brakes crying out for you to come get them fixed! Here at National Spring, our expert mechanics have specialized skills that include professional brake maintenance and repair. We can perform full services on any hydraulic, air, or electric braking system. Keeping your brakes up to snuff and long haul-ready is what we do, so even if you have the slightest worry about the health of your brakes, visit our Contact Us page and schedule an appointment today! Being safe in your truck comes first. Let us make that a reality. “If it’s not broken, don’t fix it,” is usually good advice, but when it comes to regular spring and suspension maintenance, you can’t afford to wait until something breaks. Pushing off truck spring repairs, which extends the life of your trucks and maximizes your vehicle ROI, costs you more money and time in the long run. When getting on the road and staying on the road is what keeps you in business, you can’t afford a sudden breakdown and the work stoppage that results. We won’t sugarcoat it. Neglecting springs and suspensions on heavy duty trucks or trailers in construction and logistics is not good for you or your drivers. All those uneven surfaces, punishing odometer mileage stats, and the literal tons of materials in the backs of trailers and truck beds break down springs much faster than in, say, your sister’s Subaru carting Junior back and forth from pee wee football practice. Even extra fortified leaf springs can still collapse, which could make your fleet dangerous and difficult to drive at best, and totally inoperable at worst. Severe spring damage also causes the back end of a truck bed to sag, which harms fuel efficiency and makes the truck difficult to control during emergency situations or bad weather. Spring and suspension wear and tear can contribute to lower back pain for your drivers, and it’s important to keep up with spring maintenance in order to avoid terrible traffic accidents, potential regulatory violations, and business shutdowns. Beyond the safety concerns, neglected springs are a major liability for your budget. First of all, emergency repairs are generally more expensive than regularly scheduled ones. A truck that’s still operable can easily make it to a mechanic’s repair shop, but a totally broken down one could require an emergency on-site repair, and you are at the mercy of current availability. Second of all, poorly maintained trucks typically require replacement parts a whole lot sooner than vehicles that get regular maintenance. Bad springs in particular also cause damage to other parts of the truck from all the jostling around and the truck’s body sitting on the wheels, which results in even more maintenance costs for you down the road. All these extra vehicle repair and replacement costs will show up in your P&L reports over time, and keep you from doing more with your money, like adding to your team or purchasing a new warehouse. For more information on spring damage and repair from a team of experts who won’t beat around the bush, get in touch with National Spring using the Contact page. Let’s keep you on the road and in business, okay?